Five years ago, a small business launching a new online product would traditionally have purchased their own servers and software, or leased servers, software and hosting services from one of many hosting providers around the world. The cloud has changed the way individuals and organizations of all sizes leverage technology. Cloud computing involves the delivery of computer hardware and software as a service rather than a product. Today, anyone can purchase, as a service, computation, software, applications, data access, storage, and much more. These changes allow small businesses and others to, among other advantages, reduce costs, improve scalability, and outsource all or nearly all of the maintenance for these services. 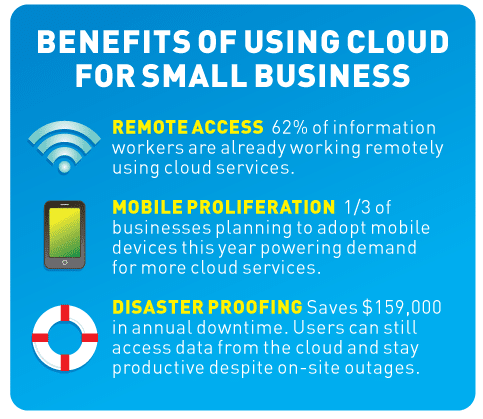 Our friends at Rackspace created the following infographic exploring the advantages of the cloud for small business and we wanted to share this with you. How has the cloud changed the way you do business today?